Our first job was secured by answering a question here at MHK Architecture & Planning. We were on the site of Glory Cottage, the name of what is thought to be the second oldest house in Naples. We had no portfolio to show the prospective client. But our personalities clicked. In the midst of discussions, and in competition with another firm for the contract to renovate Kristen Williams’ newly purchased 1912 Old Florida home, she posed question, “If wishes were fishes, what would you do?” We went back to work with a challenge to present a schematic design—our vision for what the result should be. We won the challenge with our design and the rest, as they say, is history. Naples had been deluged with Mediterranean style architecture for the previous 15 years or so, even though there was nothing truly Mediterranean about that style! Nor was it representative of Naples’ heritage. “Cracker Houses” were actually the architectural genre of old Naples. We took that historic style and modernized it, respecting the past, something that other styles didn’t do. With elongated brackets, raised ceilings, larger windows, transom windows, standing seam metal roofs, horizontal lap siding and vertical board and battens, and white paint—lots of white paint—we tweaked the Old Florida style into something that has taken Naples, and the architectural world, by storm—Coastal Contemporary design. Coastal Contemporary, for all its similarities to Old Florida, has some distinct differences. 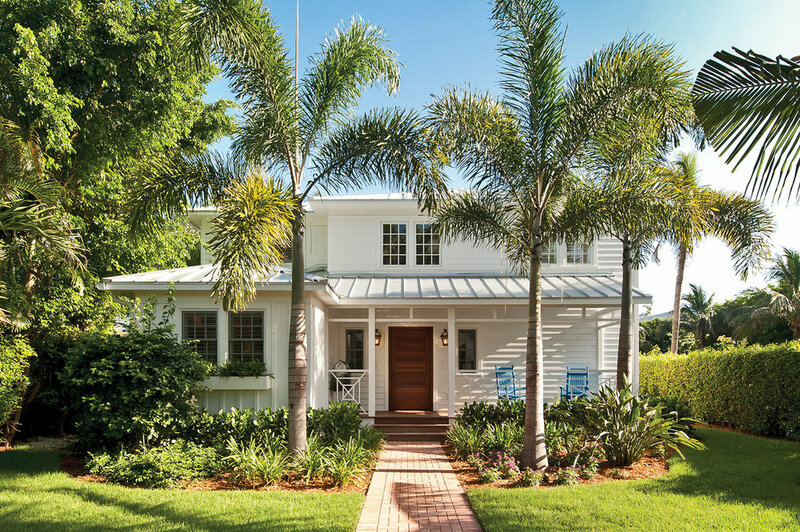 An Old Florida home will usually have smaller doors and smaller, mostly double-hung windows, lower ceilings, and will present a quainter, cottage-like look. Roofs are typically 5-v crimped metal instead of standing seam metal. A Coastal Contemporary home will typically be larger and more detailed—larger square footage, larger windows, taller ceilings. We also introduced a smoother stucco feel, mixed with the traditional lap siding. In neighborhoods like Port Royal, where metal roofs are not allowed, slate tiles take its place which still holds to a historical look. We think of Coastal Contemporary as the first cousin of Old Florida style. This newer style has dominated Naples architecture since 2012 and it is here to stay. We have designed over 550 homes, with only a handful of them slightly transitional in design. Virtually all others have been Coastal Contemporary, including multiples for Mrs. Williams and other developers. We are being copied a lot, and we agree that imitation is the sincerest form of flattery. We have potential clients coming to us with folders of pictures they have torn from magazines, printed off the internet, seen in brochures, etc., and unbeknownst to them, the photos are of homes we’ve designed! We applied this signature Coastal Contemporary look to a unique, well-received project with Naples ReDevelopment, renovating an old, rundown apartment complex with an alley-loaded product. The shotgun homes are sited on 40-by-150-foot lots with a traditional front elevation. With your first steps inside, you are in the kitchen/dining/great room with a giant sliding glass door that looks onto a private pool courtyard and across that to the garage on the alley. Mustique of Olde Naples, a four-home project by Belz Properties was another instant hit. The furnished model sold upon completion, a second home was sold during construction and the remaining two were sold pre-construction. Makaya, a development of three two-story houses followed suit. We did a few more projects showcasing Coastal Contemporary design in an urban living setting. With their inside/outside living ambiance, set in gorgeous, walkable neighborhoods, the homes feel like they are 60-feet wide! Not limited to single-family homes, Coastal Contemporary design can grace multi-family, mixed use, and even commercial buildings. So|Ce Flats at 101 Eighth Street South in downtown Old Naples will feature eighteen hotel/residences above 4200-square-feet of commercial space. The Residences at Mercato by the Lutgert Companies is a gated enclave of 52 single-family homes just north of the Mercato retail center. The 33 detached homes and 19 villas are all Coastal Contemporary designs. We have even taken this look to Nantucket, where we are currently designing a private residence. That’s not surprising, as Naples is becoming Nantucket-like in its continuity. There’s plenty of design variety in both locales, and both harbor a respect for the coastal influence, which is really a respect for the history of the area. MHK specializes in the design of single-family and multi-family residential, commercial office, mixed-use developments and master planned communities.